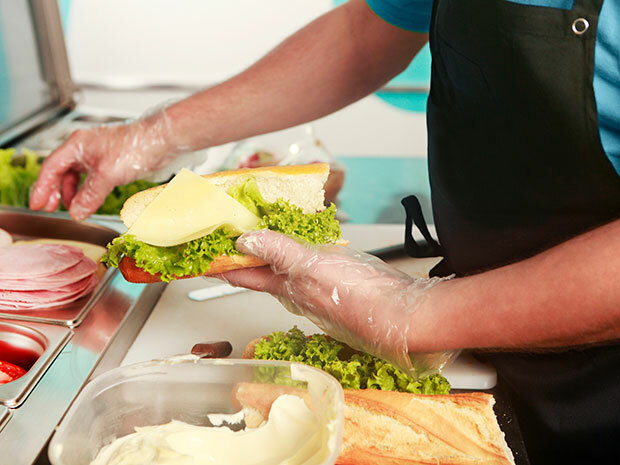 In today’s environment of intense media scrutiny and public concern about food safety, foodservice operators are seeking better ways to train new employees and immerse them in the culture of safe food. A key tenet of South Haven’s training is that food safety practices must be performed all the time, no matter how busy the kitchen is. Of the same mind is Pittsburgh-based Wholesome International, a 40-unit franchise of the Five Guys burger brand and operator of four Choolaah Indian BBQ eateries. Its training program emphasizes that food safety procedures are mandatory elements of all kitchen tasks, including when the pace of work is frenetic—being busy is never an excuse to cut corners on safety. Thus, food safety practices become embedded in the work. “There are always five steps you have to do, whether there are five people in line or 500,” says Hernandez. In recent years, Virginia Tech has increased the amount of food allergen training for new employees, due to a sharp rise in allergies among students. Newbies are schooled in the eight most common allergens and how to counsel students to make safe eating choices. “When we train people, we insist that if they don’t know the answer about what’s in a menu item, they must talk to someone who does,” such as a manager or dietitian, Watling says. Making the subject of food safety immediate and memorable for new hires is one of the trainer’s challenges. STOP Foodborne Illness, a Chicago-based nonprofit organization dedicated to preventing illness and death from foodborne pathogens, brings speakers who have personally suffered from foodborne illnesses to the training sessions of food manufacturers and foodservice operators.